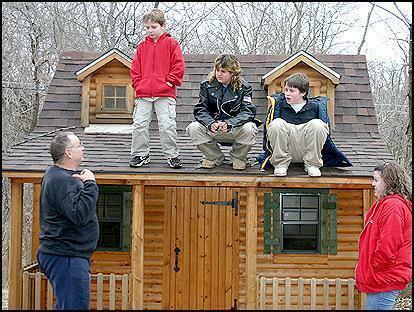 Clay, T.J. and Dalton Williams relax on their state-of-the-art clubhouse, while parents Andrea and Matt look on. The clubhouse was donated to Clay from the Make A Wish Foundation after Andrea sent a letter telling representatives of the foundation about Clay's Faconi's Anemia disease. Photo by BRANT STACY/The Kansan. Clayton Williams' mom knows her son is a lucky boy. Clayton, who was diagnosed with Fanconi Anemia at age 6 months is now 11 years old and a student at John F. Kennedy Elementary School. His mother, Andrea, said she is glad doctors discovered Clay's condition early after she questioned the way her son's thumbs looked. "I first noticed his thumbs were a little deformed, which is one of the signs someone with Faconi's has," Andrea said. "I was then told to go to Children's Mercy Hospital where genetic doctors diagnosed Clay with the disease." Faconi's Anemia, a blood disease that can eventually develop into leukemia, is a result of defective recessive genes inherited by both parents. Besides leukemia, the disease can lead to bone marrow failure. Clay's mother and his biological father both carry the recessive trait. Andrea, who was adopted said she was not aware she or her ex-husband carried the gene. It wasn't until Clay's diagnosis that caused her to get in contact with her biological parents. She then discovered her dad was a carrier, also. "Because both my ex-husband and I were carriers, Clay had a one in four chance of in developing the disease," Andrea said. "My other sons are most likely carriers and do not have the disease." Because Clay was diagnosed so early, Andrea said it has allowed her and her family time to seek the right medical help Clay needs. Once a month Clay gets a biopsy at Children's Mercy Hospital in Kansas City, Mo., where his white blood cells are properly monitored. Every six months, he travels to Fairview Hospital in Minneapolis, Minn., where doctors have been given more than $25 million in grants to study the disease, said Andrea. 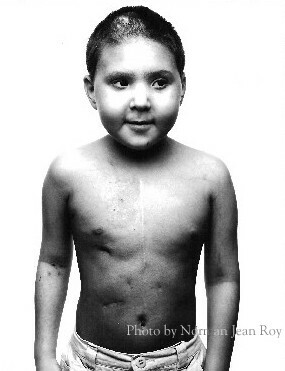 At this time, Clay's parents and doctors are postponing a transplant, which could cost at least $295,000. Andrea said one of the reasons she and doctors delaying the procedure is because they feel those specialists studying Faconi's will find better methods of treating it.